Cet hiver, Jared Padalecki campera le rôle de Thomas Kinkade et sera pour la première fois en haut de l'affiche en compagnie de Peter O'Toole dans le film "The Chrismas Cottage". Le film est écrit par Ken LaZebnick et sera réalisé par Michael Campus. Il racontera l'histoire de la vie de Kinkade, celle qui l'a menée à devenir un des artistes contemporains les plus appréciés par le public. "The Christmas Cottage" commencera à être filmé à Vancouver (ou est aussi tourné Supernatural) à la fin du mois, et sortira en Décembre aux Etats-Unis. Ah il a l'air super le film!! il s'agit d'une trilogie ! et comme Jared joue Kinkade, il sera présent dans les 3 volets ! Eledhwen a écrit: il s'agit d'une trilogie ! ben non, pas double, mais triple ! pressée de le voir ! missjared a écrit: pressée de le voir ! Alors tout se passe bien pour JP qui tourne en ce moment The Christmas Cottage, qui sortira la 14 Décembre aux Etats-Unis. 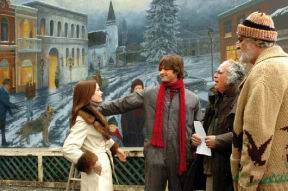 If it’s May 2007 in Fort Langley, it must be Christmas 1977 in Placerville, Calif.
At least, it will be for a stretch of 25 days, as movie crews film scenes from the Thomas Kinkade biopic The Christmas Cottage outside the village’s landmark yellow community hall. Set to be released Dec. 14 by Lions Gate Films, The Christmas Cottage, takes audiences back 30 years to tell the story of how Kinkade became the well-known inspirational painter he is today. The movie, which is being filmed entirely on location around Langley and Aldergrove, opens as a young Kinkade returns home for Christmas to learn his mother, MaryAnne, is about to lose the family home. 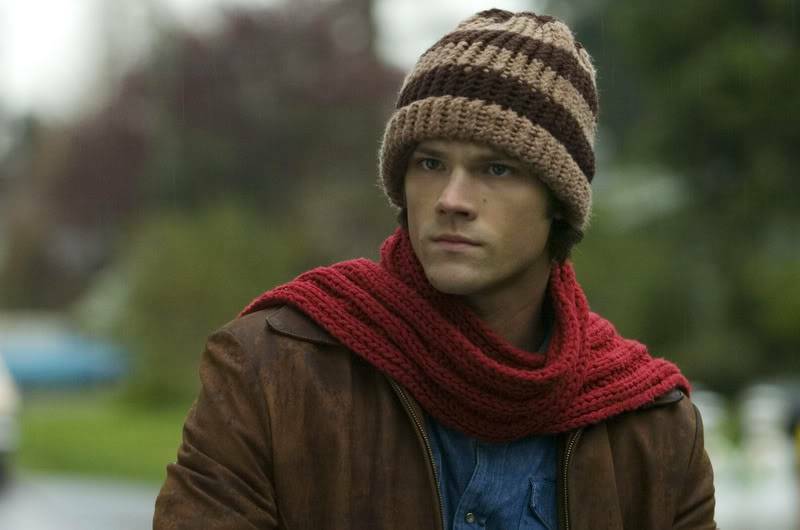 Kinkade in his younger years is played by 24-year-old Texan Jared Padalecki, best known for his television work in Supernatural and The Gilmore Girls. Marcia Gay Harden (Mystic River, Mona Lisa Smile) plays his mother and famed Irish-born actor Peter O’Toole portrays Glen Wessler, an artist who mentors Kinkade during the early days. Other celebrities on set include Richard Moll, best known as the dim, but lovable bailiff Bull, from television’s Night Court and Chris Elliot (There’s Something About Mary). The men play Big Jim, a Placerville resident, and the manager of the town’s Chamber of Commerce, respectively. Canadian actors working on the film include Aaron Ashmore, Nancy Robertson (who plays Wanda on CTV’s Corner Gas) and Robson Arms’ Tegan Moss. Unlike many summer-shot Christmas films, which find the actors sweltering in wool hats and scarves, this spring’s cool, dreary weather has been ideal for shooting scenes to look as though they are set mid-winter, said the film on-set publicist, Bill Vickers. “It hasn’t been good for anyone else, but it’s perfect for us,” he laughed. High winds on Wednesday did, however, manage to knock over the giant Christmas tree set up on the front lawn of the hall, he said. As the massive evergreen toppled, taking its strings of decorative lights with it to the ground, one of the crew members quipped, “Oh, just like at home,” Vickers said. Later, prop masters tucked a pair of fake legs under the boughs to make it look as though some unfortunate bystander had met his end under the falling tree. Hi-jinks aside, the crews have made every effort to disrupt life in Fort Langley as little as possible while they film, said Vickers. Anyone working on the production parks outside town and is shuttled to the set to save parking spaces outside businesses for paying customers. And when traffic on Glover Road has to be shut down, it is in five minute increments at the longest, he said. Vickers said there have been a number of curious onlookers watching each day from the sidelines. And when a group of film students came by to check out the production, he managed to get them a little closer to the action. “The town is being very nice to us and we appreciate it,” he said. Kinkade, who was in Fort Langley last week and will return later this month to film more scenes, plays himself as he is today and, “in a very inside joke,” a member of the Hell’s Angels bike gang, explains Vickers. O’Toole is also scheduled to be on set toward the end of May. Eledhwen a écrit: moi aussi !!! Ca a l'air d'un film pas mal! Parce qu'étant donné sa filmographie jusque maintenant, y'avait de quoi avoir peur! Mais l'histoire a l'air intéressant, les autres acteurs sont géniaux, y'a pas les soeurs Olsen ni Paris Hilton... C'est tout bon! y'a pas les soeurs Olsen ni Paris Hilton... C'est tout bon! Tres heureuse pour lui! et je ne pense pas le rater qd il sortira! Espérons que ce film me fera avoir tord! merci merciiii ellle est trop belle!trop craquant avec son bonnet!